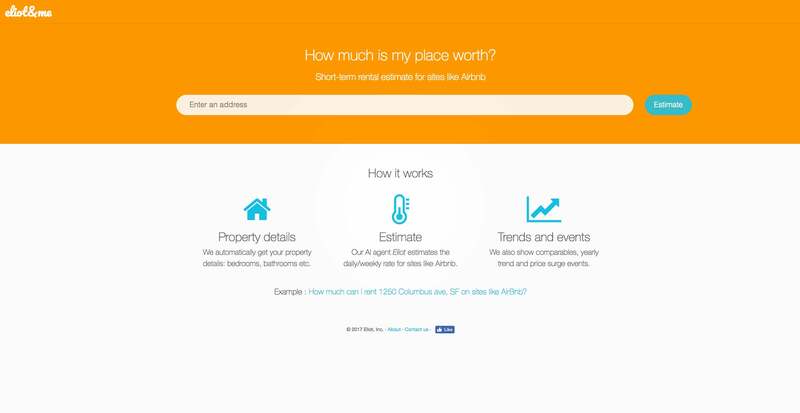 Considering renting your home out on Airbnb? You’re not alone. This platform and others like it have grown rapidly over the last decade. In fact, Airbnb now has more listing across the globe than the top five hospitality brands combined. Of course, letting strangers into your home can be nerve wracking. Home rentals aren’t legal in every municipality and while rare, nightmare guests do exist. But a new tool can help you better weigh your options and see if the potential hassle might be worth the extra cash. While Airbnb has long offered a built-in estimator, that tool doesn’t take into account factors such as season or demand. The startup Eliot & Me recently launched an AI-powered calculator that will give you a more accurate renting price for your Airbnb and a better sense for what you could make. After inputting your address, Eliot & Me will automatically pull other details about your home, like the number of bedrooms and bathrooms and the maximum number of guests it could accommodate. Using data from historical trends, local competition, the busiest and highly-demanded dates and more, Eliot & Me will present the average daily, weekly and monthly renting prices over the past year and offer rate suggestions. The tool isn’t just a fit for potential hosts. Business travelers looking to plan a trip can check if a unit is overpriced. It could also help them save money or hassle by traveling around busy seasons that might not always be obvious, especially when travelling to smaller cities across the country.